Bainang County is located on the banks of the Nyangchu River in Shigatse City, southwest China’s Tibet. The county has 127,400 mu (20,987 acres) of cultivated land. After more than 20 years of development, the county’s fruit and vegetable cultivation industry has finally taken shape. Fruit and vegetables produced in Bainang County currently account for about 30 percent of the Shigatse market, and it is planned to account for 50 percent of the entire Tibetan market by 2020. At the same time, they have also attracted a number of well-known agricultural businesses for industrial development and will focus on mid- to high-end consumer markets in inland China. It is reported that the fruit and vegetable planting area covers more than 14,000 mu (2,306 acres) and produces nearly 140 varieties. “In recent years, 951 family farms and large planting households in Bainang County have been cultivated, and there are 128 professional cooperative organizations,” the county’s head of agriculture and animal husbandry said. In October 2018, Bainang County officially rose out of poverty. The fruit and vegetable cultivation industry directly led more than 4,000 people out of poverty, and the industry contributed more than 60 percent to poverty alleviation. On March 15, Migmar Tsering of Luojiang Town, Bainang County, Shigatse City, southwest China’s Tibet was dragging watermelon seeds in their own greenhouse with his family members. It is reported that he is a locally famous “watermelon grandfather”. 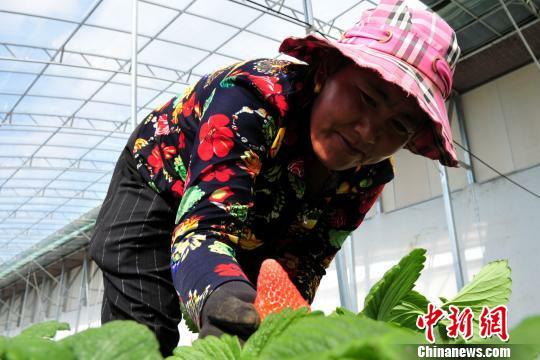 On March 15, 37-year-old Zongye picked strawberries in a greenhouse in Bainang County, Shigatse City, southwest China's Tibet Autonomous Region. It is reported that the fruits and vegetables from Bainang County are mostly organic, and their prices are relatively high. At present, strawberries from Bainang County cost 100 RMB (15 US Dollars) per kilogram.